I have a new favorite lunch this week. Confession: I’ve had it twice this week already. 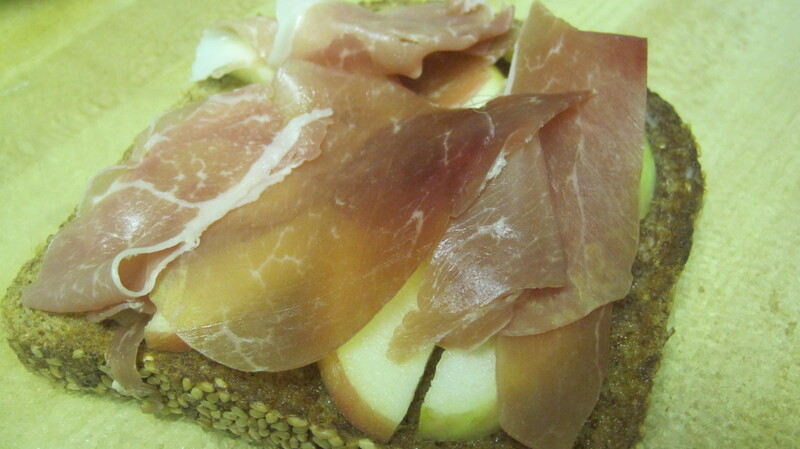 Introducing: apple, brie and prosciutto flat top. Of course all the lovely toppings are sitting on a slice of sesame Ezekiel bread. The apples are organic from the farmers market and are of the honey crisp variety. Honey crisps are by FAR my favorites. So crispy and delicious! I like to toast the bread and then let the brie melt onto the bread. Holy melted goodness! I don’t post my lunch very often because I tend to latch onto one thing and eat it several times over a week meaning that lunch tends to be a bit boring (unless of course I hit a lunch truck!). I also tend to make double portions of dinner and save half for lunch. Obviously this flat top is the flavor of the week. In other news: I came home from school and promptly ran a little over 5 miles. For those that are keeping track, that’s a little over 14 miles in three days. I am a running beast this week!